It’s really busy in town, so I don’t have time to write much. I have to get back to the shop to scoop ice cream! With the days either rainy or cloudy, I´ve continued to spend my time in Barcelona walking and eating. 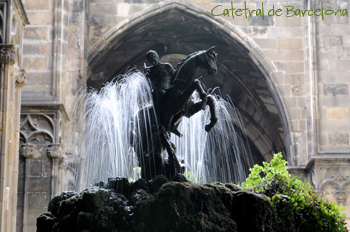 The Catedral de Barcelona (photo above from the garden) made a welcome respite from the drizzle. 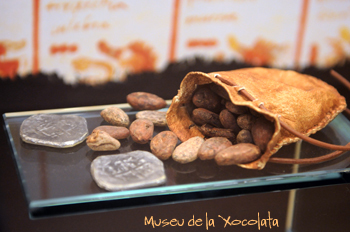 So did the Museu de la Xocolata, which doesn´t really have that much to offer, but is a must for a chocoholic like myself. There´s a little walk through history, including the use of cocoa beans as money (photo right), a slide show that I couldn´t make work, and some sculpures of chocolate that might be impressive in terms of craft but wouldn´t exactly win art awards. Being Barcelona, a good amount of the exposition was given to FC Barcelona, although I couldn´t quite understand the connection between football and chocolate. Perhaps the best part of the museum is the shop, where you can buy all sorts of artisan chocolates or drink a cup of the hot stuff. Another place definitely worth checking out if you like chocolate, is Cocoa Sampaka. 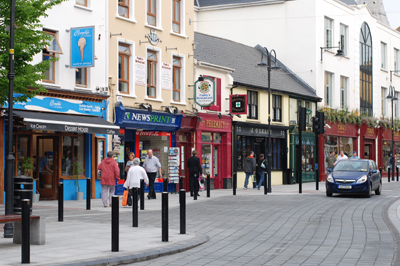 There is a shop as well as a cafe in the back, and you are sure to come out with a bounce in your step. 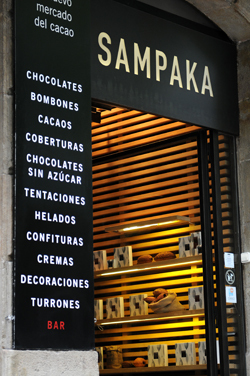 I think it´s my favourite chocolate shop in Barcelona. What else can I report? 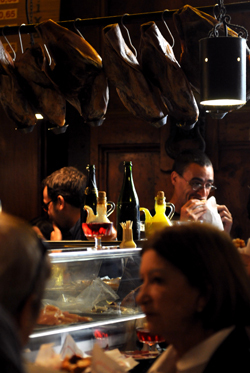 Tulanian´s suggestion of Bar Central at the back of Mercat Boqueria was spot on. Definitely worth a visit if you like seafood. Many of the other places I´ve gone have been little hole in the wall places that my friends here have brought me. All of them good and interesting. 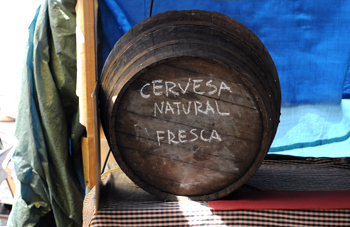 I had a beer of homage in Manu Chao´s pub. Now I have one more day. Spain has been great but too rainy. I need to go back to Ireland for some sun! There’s so much I could write about here in Barcelona, but I’ll keep it somewhat brief. 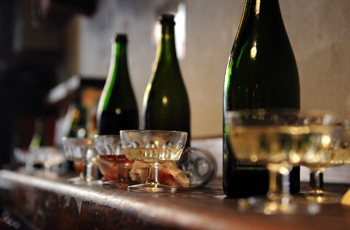 What strikes me more than anything, is how this city revolves around eating and drinking. It truly is a food and drink culture. 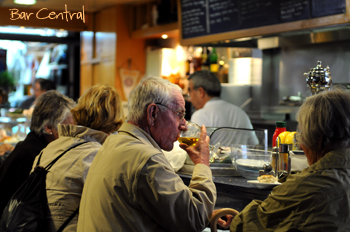 Between the restaurants, tapas bars, markets, cafes, and snack shops, there is very little danger of going hungry or thirsty. 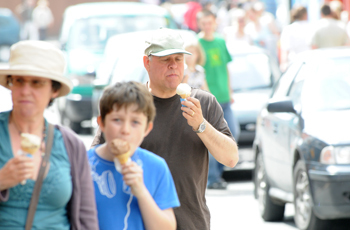 People eat standing up, walking, sitting down, or any combination of the three. It is also amazing to me how happy people are to have a drink as well – at any time of the day. When I go in for my breakfast coffee, it seems quite normal for business people to be chatting over a beer and a croissant. I’d give you the name of the place, but it doesn’t have any sign outside the door, and my friends had no idea what it was called, assuming it’s called anything. 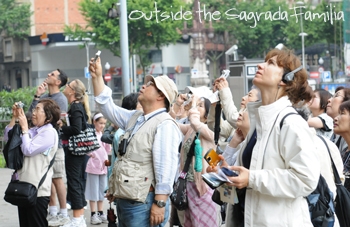 If you want to find it, go to Carrer de la Reina Cristina (by the water, and only a block long) and look for the people spilling out onto the street. Seemingly it’s always packed. I’m happy to report, though, that between the eating and drinking, I did manage to attend an outdoor concert of Juan Moneo at the Flamenco Festival that’s on at the moment. Needless to say, there was a convenient pavillion selling sandwiches (along with the booze) in case the music went on too long and people began to feel peckish. I ordered a beer. Perhaps worried that I wasn’t eating, they gave me two. Today, I felt the need to walk off the calories, so I followed your suggestions and went for a Gaudi stroll. His buildings are certainly very impressive and makes one wish for more interesting contemporary architecture at home. It’s quite amazing to wander down a street and encounter his soaring curves and sense of fun. The Sagrada Familia, although astonishing in scale, didn’t really do if for me, as the church remains unfinished and is basically a construction site. There were no shortage of people, however, delighted to part with 8 euro to photograph scaffolding and mesh-covered walls and be jostled by overwhelming crowds. Maybe I made the mistake of going on a Saturday and encountered more visitors than usual, but I think it was the worst-spent money of my trip. Much more satisfying was Parc Guell, commissioned by Gaudi’s patron count. I spent a couple of very happy hours wandering around in amazement. Designated a UNESCO World Heritage Site, it is not to be missed, even though it’s a bit out of town (bus 24 does the trick). 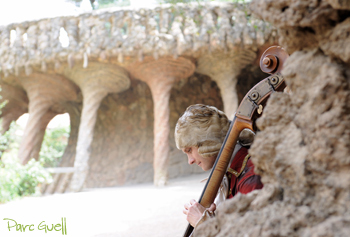 In the park, you can appreciate the genius of the master, and there are enough winding paths and little nooks that it’s very possible to find a bit of peace and quiet as well (although musicians do tend to pop up). It’s perhaps the best example I have ever seen of nature meeting design, so much so that you hardly know what is native rock, and what is art. If you climb up the hill to the very top, there are some wonderful views across the city. Now I must leave this. I’m hungry again! P.S. I missed the match, but the texts are pouring in. Up Munster! Even though I’ve been spritzed and sprinkled by the rain, I’m quite happy to be here in Barcelona! My feet are sore, my belly is full, and I’m feeling more relaxed already. And no, that’s not me in the above photo. Thanks, everyone, for your tips, and keep them coming! Last night, after arriving and sampling a few tapas, I headed to the Gran Teatre del Liceu, the opera house. Sadly, there was no opera on, but I did get in some ballet. The Hamburg Ballet, under the direction of John Neumeier, performed Death in Venice. It was boisterous, controversial, and witty – words not usually associated with this art form. I liked it very well indeed. Today, after an excellent cafe con leche at the corner bar, I wandered. 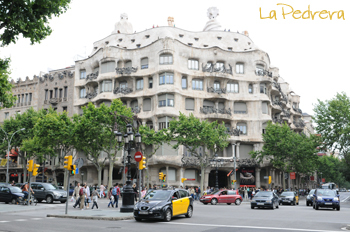 Of course, I had to start with La Rambla, the famous place to stroll along with all the other tourists. 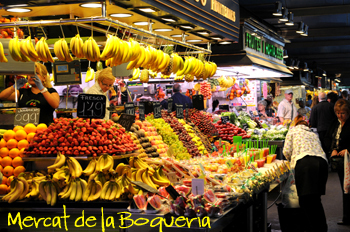 A quick sidestep, and I found myself in the wonderful Mercat de la Boqueria, a teeming food market dating from 1200 AD. Very impressive, and some fresh mango juice gave me just the boost I needed. Inside I also found Tulanian’s hot tip: Bar Central, for grilled seafood, but it was a bit early in the day for me to think about savoury comestibles. Instead I strolled through the Barri Gotic, the old Roman part of town, until I found the Picasso Museum. Not a bad way to escape the rain for a few hours. The museum is especially noted for his early work, and it gives quite an insight into the progression of an artist. I had a passable chocolate crepe in the museum cafe. More wandering, then I met a friend who took me out for – no, not tapas – a feed of excellent sushi (do as the natives do). Apologies – I forgot to make a note of the name of the restaurant. 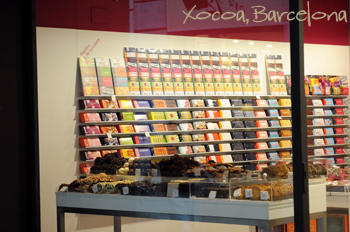 A couple of people suggested checking out Xocoa, a chocolate shop. Twist my arm. Kate – it still exists at Calle Petritxol 11, and I should know, because I stuffed myself! I haven’t mustered up the courage yet to try their wasabi-flavoured chocolate bar. It’s in the bag, however, and I’ll turn to it if supplies run short..
I’m sneaking off tomorrow for a week in Barcelona. I haven’t been there in a long while, so if anyone has any tips in terms of where to eat, where to find the best hot chocolate, best ice cream, or best anything, I’d love to hear them! 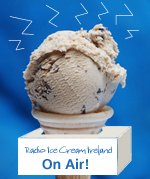 For those of you in Ulster, I’ll be on BBC Northern Ireland’s Weekend Magazine tomorrow morning (Saturday) at around 10:45 am to talk about ice cream and the book. You can listen on-line here.